On the 19th April 2017, UAL’s Black Artists and Modernism project team organised a study day focused on the artist David Medalla. 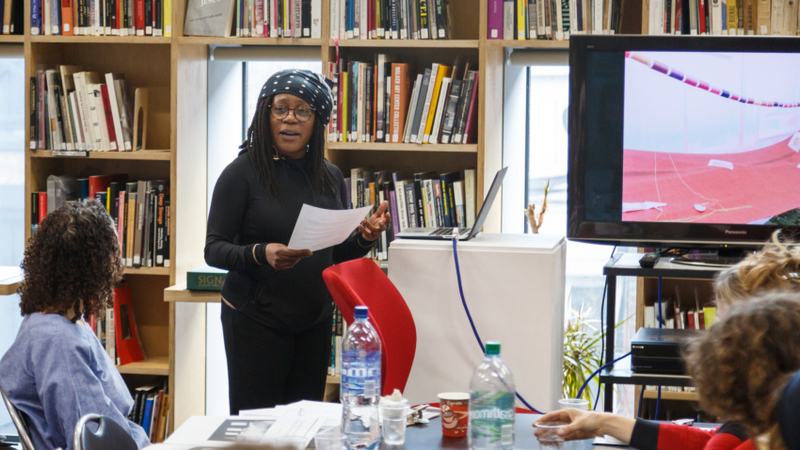 This was the third study day that the BAM project had organised at Iniva’s Stuart Hall library as part of our recent collaboration. The day began with an opening by Melanie Keen, director of Iniva, and Sophie Orlando from the BAM team. Keen described Medalla in his own words as “a wandering artist and a world citizen”, Orlando defining him as a “pioneer of the transition from performative art to participatory art”. The focus of the study day was around two of Medalla’s major works: the ‘Signals’ news-bulletin (1964-1966), and ‘A Stitch in Time’ (1967-1972). It was striking to note that most artists and scholars present on the day had not only met Medalla, but most also considered the artist as a friend. 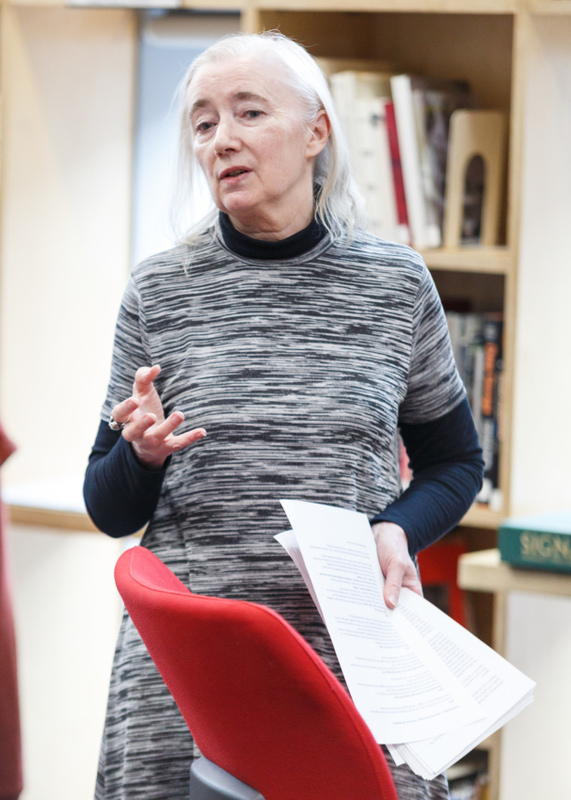 Jane England, who arrived in London in 1973 recalled meeting Medalla in her first week in the city and still remains in close contact with the artist. A sense of honoured timeliness to be present to discuss and share an understanding of the artist and his work was evident throughout the day. The morning presentations began with Gilane Tawadros on Iniva’s decision to create a facsimile of Signals magazine, and Isobel Whitelegg reflected on her essay ‘Signals London, Signals Latin America’ in her response. Signals magazine or news-bulletin, a folded newspaper, was edited by Medalla and published from August 1964 to March 1966. Signals started off as a gallery, a major hub where artists such as Lygia Clark, Carlos Cruz-Diez, Takis, Li Yuan-chia and Hélio Oiticica had opportunities not only to exhibit but most importantly to experiment. As such, Signals marked a move away from a conservative and narrow view of artistic practice: it was cosmopolitan, experimental, interdisciplinary and captured the London-based international avant-garde that contradicted the prevailing currents of Pop Art and Abstract Expressionism of North America and, as Tawadros noted, resisted a certain British parochialism. Although not claiming to specialise in Latin American art, Signals promoted a preoccupation with the region, as Latin America was seen to be participating fully in the construction of a future informed by scientific and industrial developments. Tawadros remembers the bulletin as being full of optimism, dynamic force and momentum and she was mesmerized by its internationalist energy and spirit, which embodied everything that Iniva aspired to. As the founding director of Iniva, Tawadros recalled the generations that had propelled the institute into its existence with a brief to promote artists of international backgrounds. It thrived by refusing the politics of difference prevalent at the time, and was framed by four themes: a desire to articulate new internationalism, a desire to reject binaries, a focus on the work itself and to critically embrace change and flux. 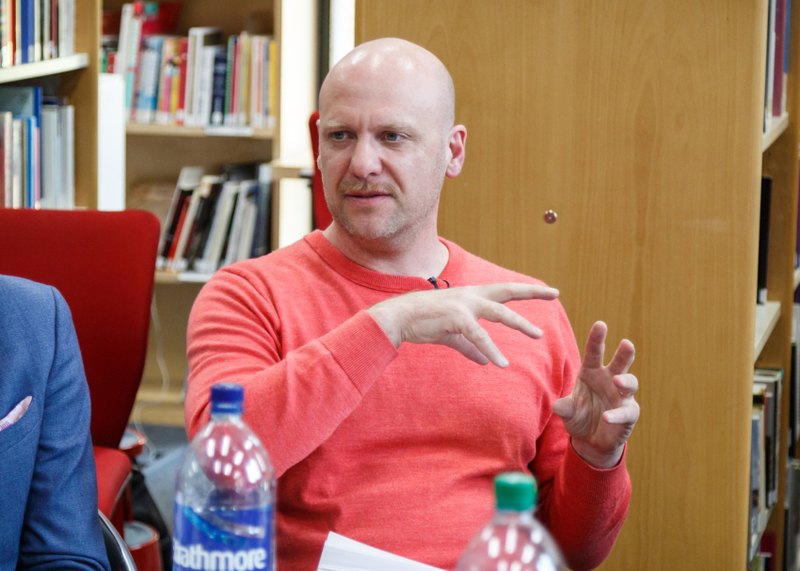 The engagement with change and flux is undoubtedly the common force that drove both Iniva and Signals. Medalla used the word propulsion, always pushing forward, and rather than the conclusion or the end product, it seemed the process was what mattered most to the artist. 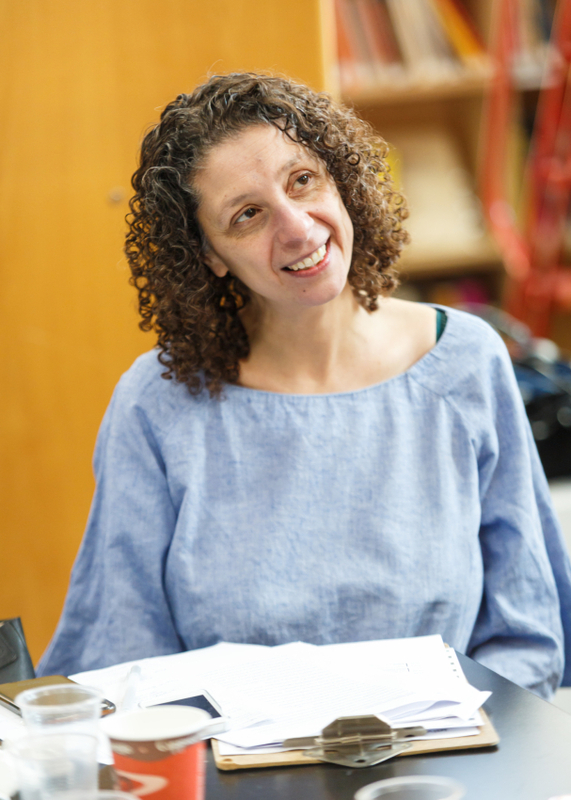 When Tawadros invited Medalla to issue a special edition of Signals, he brought bags of materials and stories about how he met people and how people connected with one another, but there was no sign of ever getting close to completion, she recalls, needless to say it never happened! A distinctive interest with the process meant that things that did not happen or things that could have happened were surprisingly a significant part of Signals. Whitelegg described the myriads of peculiar and remarkable unrealized plans that were included in the bulletin. Similarly, many of Medalla’s artworks were not actually made but existed as ideas, or were made with detritus and ephemeral materials at hand. Things and stories always had a pre-history and seemed infinite or limitless. Everything with Medalla was it seems in a state of flux. Medalla’s participation in group exhibitions, where his work was curated by others was considered in Eva Bentcheva’s presentation of When Attitudes Became Form: Conversing between David Medalla’s Practices and Harald Szeemann’s Vision of ‘Concept-based’ Art and in Lucy Steeds’ response reflecting on her interview with Medalla in 2008. Medalla’s collaboration with the Swiss curator Harald Szeemann stemmed from their common approach to art and their shared interest in the work of the creator. Exhibitions were seen not merely as a place to show the works, but as a platform to convey the presence of the artist and the curator. Szeemann and Medalla collaborated on three shows during that time: the first was ‘Weiss auf Weiss’ (Kunsthalle Bern, 1966), the second ‘Live in Your Head: When Attitudes Become Form: works-concepts-processes-situations-information’ (Kunsthalle Bern, 1969), and finally ‘Documenta 5, Questioning reality- Pictorial worlds today’ (Kassel, Germany, 1972). Medalla wasn’t in Europe when Szeemann was working on ‘Live in Your Head: When Attitudes Become Form’. He wrote to Szeemann confirming his intention to participate in the show and, like many other artists who sent works to be included from abroad, he submitted sketches and drawings, although Medalla was unsure whether Szeemann ever received any of them or if he did, what he may have done with them. This again highlights Medalla’s focus on the process and his investment in the ephemeral. In the end, Medalla may not have had any work shown in the exhibition, however Szeemann still acknowledged his contribution in the catalogue. Szeemann articulated his struggle to categorise or indeed write about the works of art in the catalogue of ‘When Attitudes Become Form’. This was mirrored by Steeds, who recalled the many ways in which Medalla, who avoided categorization, labeled his own work over the years as auto-creative art, air-art, earth-art, instruction-art… Medalla was resistant to the term conceptualism. He was wary of categories that didn’t cover the full scope of his practice. Resistance, noted Tawadros, was part of his modus operandi. ‘Documenta 5’ is now perceived to be one of the most groundbreaking exhibitions of the last 50 years and was both hailed and derided by artists and critics at the time. It marked a real transition: exhibitions became a platform where artists were given free reign. ‘Documenta 5’ exhibited over 200 artists and examined how to create art to perceive contemporary reality, how to transform reality and create alternative realities, each artist bringing their own political worldview. A version of ‘Cloud Canyons’ and ‘A Stitch in Time’ were displayed, although Medalla wasn’t present to discuss either work. Medalla’s participatory work entitled ‘A Stitch in Time’ was the focus of the afternoon session of the Study Day with Sonia Boyce’s presentation ‘Unconventional sculpture and queering women’s work in A Stitch in Time’ (1967-1972), and Annie Kwan considering ‘A Stitch in Time? Situating David Medalla’s Participation-Performance’ between British and Philippine Performance Art History’ as her response. The best way to describe ‘A Stitch in Time’ is through David Medalla’s answer to his friend Australian artist Adam Nankervis’ query as to what the inspiration for the work was: Medalla had met two of his lovers at Heathrow airport and had given them each a handkerchief with an embroidered love message, some needles and a small pool of cotton thread, and had told them they could stitch anything they’d like. Medalla had then lost track of his lovers. Many years later at Schiphol airport in Amsterdam, he noticed a handsome young man carrying a backpack to which a column of cloth was attached. Requesting to have a closer look, he noticed that many little objects such as Chinese coins, a broken bamboo whistle, empty cigarette packets and all kinds of embroidered messages were attached. At the bottom of the column Medalla saw the black handkerchief that he had given to one of his lovers and handed back the column without telling the young man that this column of cloth was what started ‘A Stitch in Time’. Kwan described being uncomfortable with the somewhat American/Victorian view of stitching as ‘woman’s work’, and took the participants of the Study Day on an unconventional journey through Shaivite and the quest between Shiva, Brahma and Vishnu as to who was the true father of the earth, by relating Medalla’s artistic approach to Hindu-Buddhist art, a tradition that the artist was familiar with. ‘The western viewpoint is to divide things into specific categories. The non-western viewpoint is that everything is really one cosmic whole”.6 In Hindu-Buddhism, there is a continuous flow, connecting the different spaces, coming and going between the collective and the specific. In Hindu-Buddhist art, as beautiful and perfect as a work of art can be, it isn’t complete until it is adorned by flowers or daubed by others. Similarly, ‘A Stitch in Time’ isn’t complete until the audience adds to it. Anyone who takes part is not unlike someone visiting a temple who would bring something and take a moment with the artwork; as they place their adornment, they would come and go between the sacred and the vernacular. 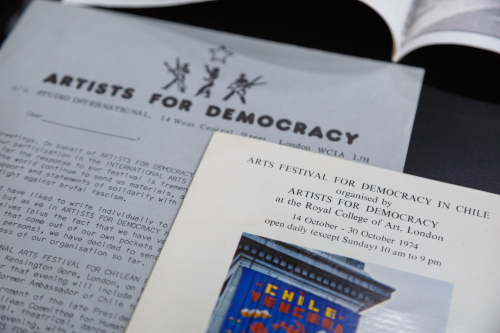 The Study day concluded with Lynn MacRitchie and Jane England’s account of Artists for Democracy’s (1974-1977) ‘Arts Festival for Democracy in Chile’ that took place at the RCA in London (1974). 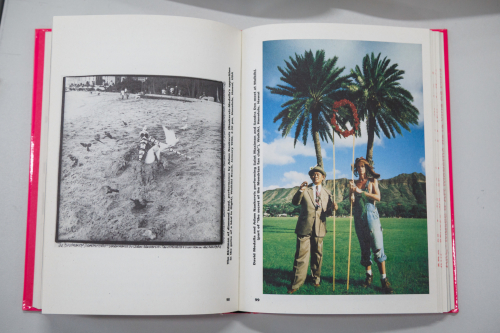 MacRitchie and England also shared their invaluable personal photography, videos, letters, invitations and other effects and memorabilia of the collective, with a response by Grant Watson. The festival was a reaction by artists to the military coup that brought down Salvador Allende in 1973. Watson discussed how the Chile vencera (Chile will vanquish) banners that John Dugger had made symbolized the growth of artists’ presence in public spaces. Medalla built a favela on the stage of the RCA that artists could contribute to: if you wanted to be part of it, you just showed up, you self-selected. MacRitchie observed the timeliness of Medalla’s political interventions and his ability to bring people together through dreadful times. Perhaps because Medalla was not constricted by procedures, at ease with using objects at hand, making art from chicken bones when in India, taking pictures and sending sketches of his evanescent ideas; because of an interest in what may become, and because ultimately the process of making mattered more than the result, to me he embodies the saying ‘it’s the journey that matters’. The many stories narrated throughout the day gave me a sense of the warmth and openness of Medalla. He seemed to have found endless inspiration in the people he had met and gleaned countless ideas from the multitudes of places he had moved through. My favourite story shared, perhaps because it rings close to home, is Tawadros referring to Medalla, whose ethnic background includes Chinese, Malay, Spanish and English, as being very much like Hula Halo, a Pilipino dessert made of Spanish custard, crushed ice that was introduced to the Philippines from America, Kaong and other Pilipino native fruits. Medalla often said: ‘I feel at home anywhere in the world’. It makes sense to be at ease anywhere in the world, when not unlike ‘A Stitch in Time’ or the Hula Halo, you are made of particles that constitutes it. 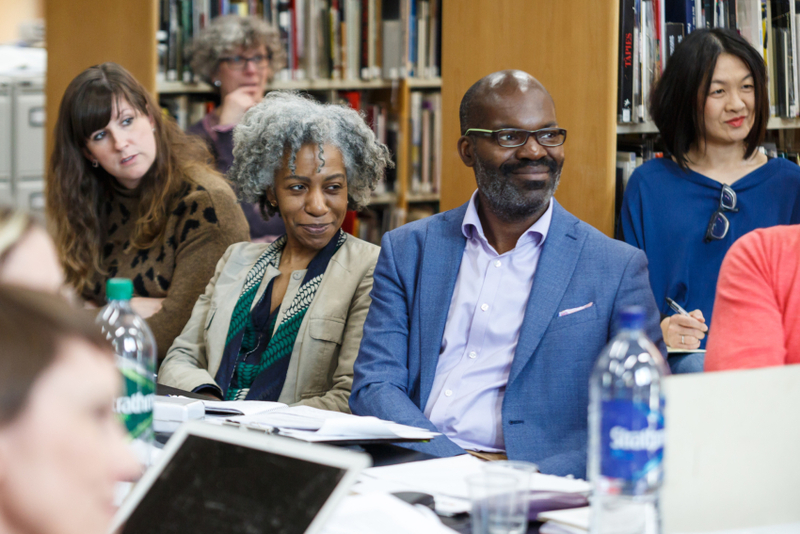 Black Artists and Modernism (BAM) is an AHRC funded project lead by UAL in collaboration with Middlesex University and Illuminations Media. 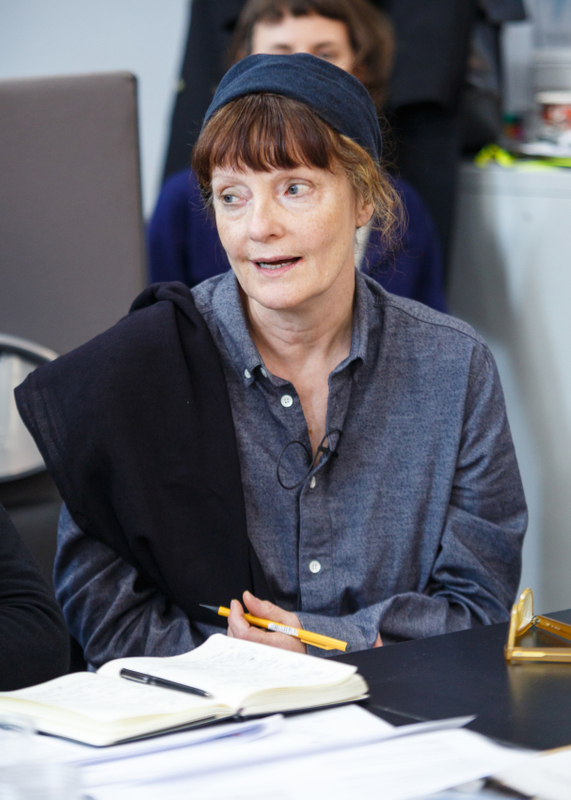 The study day was intended as a research seminar that would generate discussions towards BAM’s third and final conference ‘Conceptualism – Intersectional Readings, International Framings’ which will be held at the Van Abbemuseum in December 2017. Naomi Bulliard is a linguist and a project manager. She has a BA in Asian Studies, an MA in Applied Linguistics and has worked across all educational levels in the UK, Switzerland, Japan and Australia. 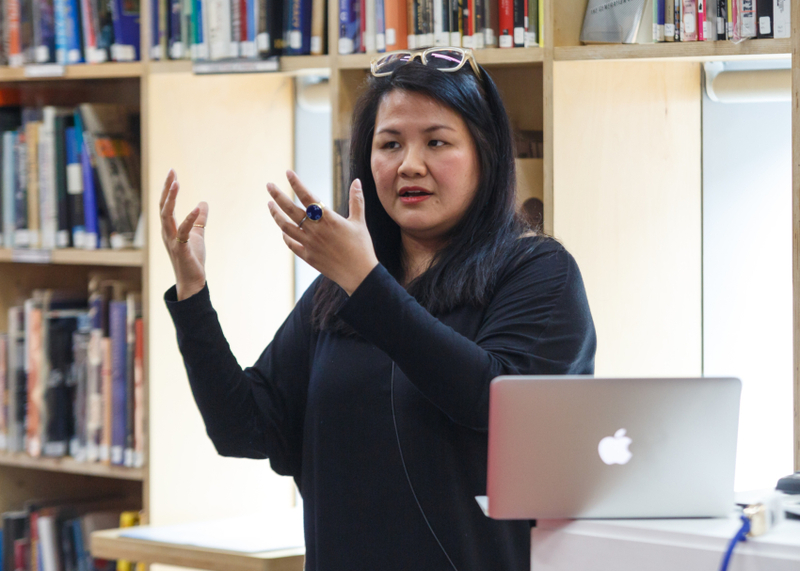 Her specialism is in multilingual education, intercultural training, curriculum development and knowledge exchange. 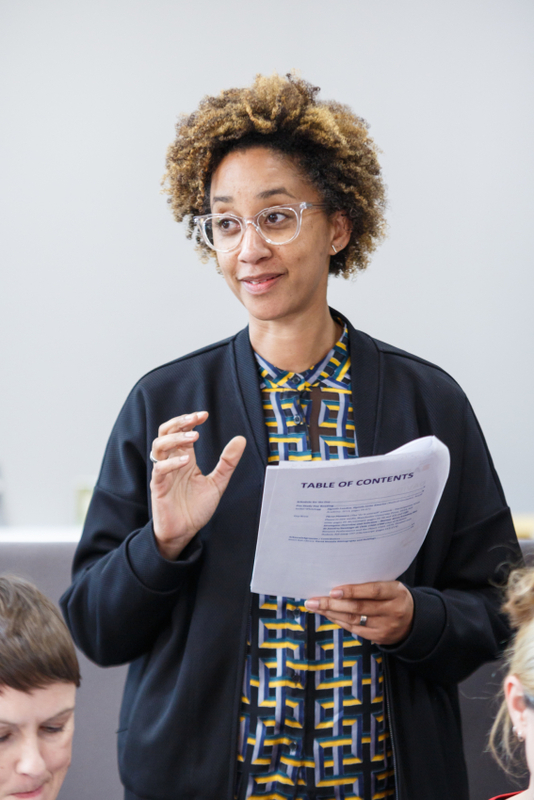 As the Research & Innovation Project Manager at UAL, she delivers a number of projects for the University, including the AHRC funded Black Artists and Modernism project.